Wool Addiction is a charming wool shop located in the heart of Bowral, in the New South Wales Southern Highlands. It's Tulip Time in Bowral! Wool Addiction is only a three-minute walk from the Grand Floral Display in Corbett Gardens, the centrepiece of Tulip Time. So, if you're coming to Bowral to see the flowers, why not visit us too? Or, conversely, if you're coming to see us, don't forget to go and have a look at the tulips! Hopefully I'll have it done before the Great Bulb Dig-Up on 7th November! It's time to learn or perfect some new techniques! Winter is over, and the pressure to provide warm clothing for our loved ones is over... for now! So, why not take advantage of the breathing space to learn some new (or brush up some forgotten) knitting techniques? With this thought in mind, we've started scheduling our new season of workshops. We have a couple of old favourites: Tension Squares, and Finishing Techniques, and we're excited to announce our brand new Cable Knitting Workshop! Just in case you can't get to Bowral, we've whipped up a new pattern, the Overhand Hat, to get you thinking about the Magic Loop. Now don't be daunted: the Magic Loop is cumbersome to describe, but once you've got it, you'll think "This is so obvious! Wasn't I doing this all along??" 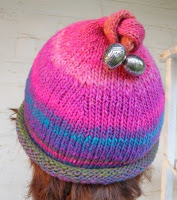 If you're interested in finding out what other knitters think of this pattern, you can find it on Ravelry! The weather is warming up, and it's time to switch to our Spring opening hours. We only planned to open on Sundays during the Winter, but we've met so many lovely new people who just can't get to Bowral during the week that we've decided to carry on. We'll close at 2pm, which gives you plenty of time to shop, and then retire to a cafe for the afternoon! If you'd like to come and knit in good company and air-conditioned comfort this Spring, why not join our new Saturday Social Knitting Group? There's no need to register or book, just turn up on a Saturday from 11am with your knitting, and $5 for tea, coffee and biccies! If you have any thoughts, question or suggestions you'd like to share, please drop us a line. We have four rooms stocked with everything to support your knitting or crochet habit, from fabulous yarns, to inspiring patterns, to funky knitting needles.